Everson, Champan, Eppel Tally 2 goals each in winning effort. The Burnsville Blaze started the 2008-2009 season with a scorching schedule as they faced three top ten teams in as many games. After battling #10 Bloomington Jefferson to a 4-2 opening night loss, the high flying Blaze fell to the defending State Champion Hill Murray Pioneers by a score of 6-0 on FSN's Hockey Night in Minnesota. Last night, the Blaze traveled to Braemar Arena to face the Hornets and were featured on the Game of the Week for MyFoxHockey.com. The Blaze were torched by the Hornets by a score of 8-1. The Hornets and Blaze played to three consecutive one goal games over the past two seasons prior to Thursday evenings game. Edina was missing defenseman Jake Heck and the Blaze had the prolific offensive force in Zack King out of the lineup. Edina wore the Blaze down in a convincing 8-1 victory as 8 different players notch mulitiple point games. All three lines contributed and the puck possession by the Hornets was impressive. Anders Lee, who is arguably the best player on the boards in high school hockey, was a man among boys and notched the first goal of the game, his 4th after Michael Sit manuevered a beautiful inside out opportunity, he shot and Lee gathered in the loose change for the 1-0 Edina lead at 8:51 of the first period. The first half of the first period resembled a heavyweight fight as each team punched and counter punched, working the neutral zone and generating chances. The Blaze responded after the Hornet goal just 2:26 later as Adam Smyth converted on an Andy Pearson pass from behind the net. The Hornets captured the lead back at 2-1 as Blake Chapman scored from Michael Sit on the power play. After sending a shot toward the Blaze goal, Chapman continued through on the puck and put away the goal on the back door off the left post with 3:20 left in the period. As the game wore on, the Hornets gathered in control of the game and the puck. Four second period goals, 2 by Marshall Everson along with Chapman's 2nd of the game and a Charlie Taft tally put the Hornets in command. John Eppel scored twice in the third period as the Hornets cruised to the 8-1 victory. John Ankeny picked up his second win on the season in goal making 17 saves for the Hornets. 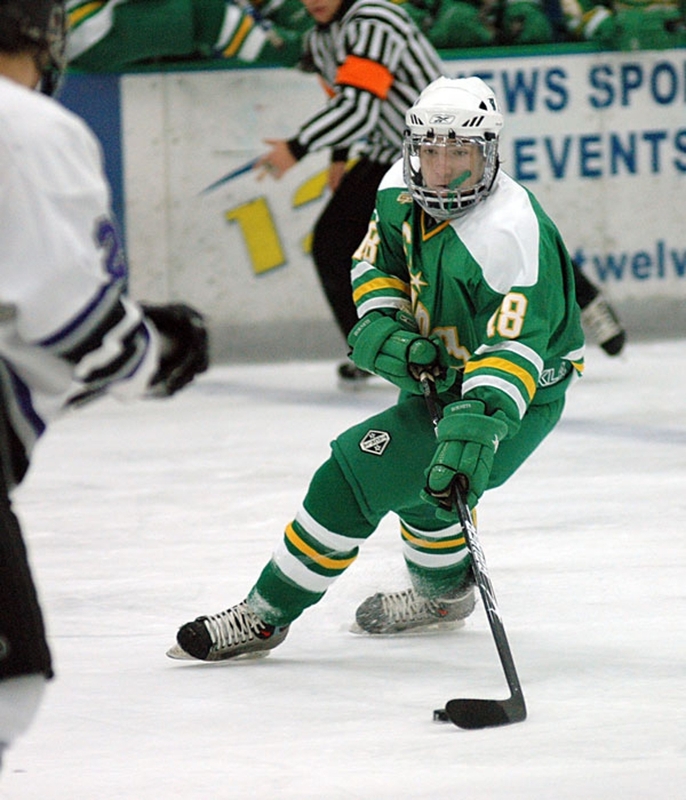 Edina (3-0) awaits a rematch of the State Final with the Hill Murray Pioneers at Braemar this Saturday night. The Blaze (0-3) dial it back in with the Lake Conference as they face off with Lakeville North at the Burnsville Civic Center. The Edina Hornets honored three of its five youth hockey teams that won State Championships at the youth level. Of the teams recognized, the PeeWee B1, PeeWeeA, and U16 White teams were introduced...The Hornets have 24 goals in three games, with out Zach Budish...The Blaze hit the crossbar late in the game as Dylan Kes rang the dinner bell just before the final buzzer...That was the Red Knights of Benilde St. Margaret's and the Stars of Holy Angels chilling in the "knowledgeable corner of Braemar arena last night...The Hill Murray Edina game will not be webcast on MyFox so make plans to get to the arena early for the classic rematch.